So, now you know my priorities in life I should probably tell you about this trio of products. The combination of these three miracle workers have kept my skin amazing & velvety smooth for a whole month (which has like, NEVER happened before). 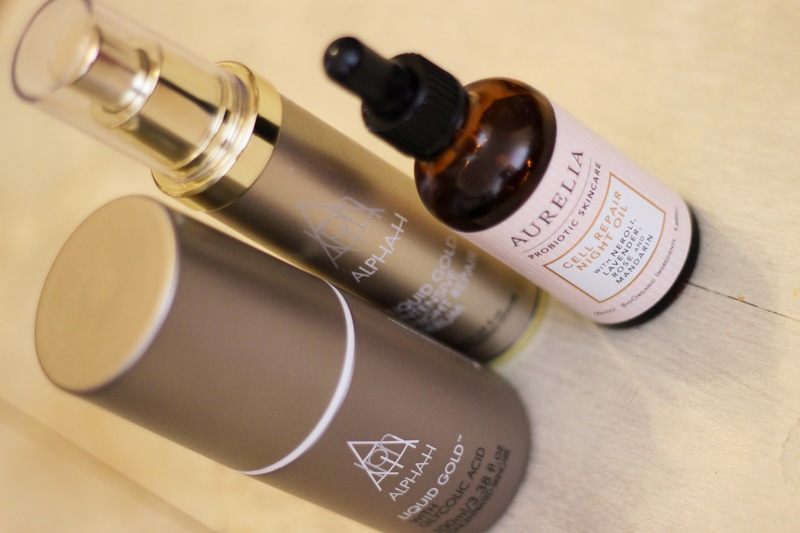 I should probably admit that I paid for none of these myself - my Mum treated me to the Alpha-H products (I had purchased them before, I just didn't this time) & I won the Aurelia Oil in a give away 5 months ago. This does not affect my opinion of them in anyway & I would be more than happy to pay for them myself (it has affected my opinion of my Mum & online giveaways though so please don't expect an unbiased review of them). If I am honest this post might not be for all of you as the combined cost of these three products is £125.50 but please hear me out for at least the last product because the effect these have had on my skin is INCREADIBLE! Alpha-H Liquid Gold (£31.50) is a classic acid toner, it is quite strong so depending on how sensitive your skin is you might not like it (I use it a maximum of twice a week) but when I'm not using this my skin goes 80 shades of messed up. I don't get a lot of spots - my skin is more into flake-y, oily dry patches & a weird under the skin rash that I can't seem to budge - anyway, I don't get spots & apparently a lot of what keeps away the spots is this stuff 'cause when I'm not using this....I don't look awful but it's not fun. On the two days a week I use this I double cleanse my face, then I swipe a small amount of this across my face on a cotton pad, apply eye-cream & then a THICK layer of face cream - the face cream stops me from waking up with tomato face. Alpha-H Liquid Gold Intensive Night Repair Serum (£49) is my other acid product. Again I use this a maximum of twice a week to stop myself from getting too sensitive. I LOVE this stuff though, I have nothing bad to say. It is a very runny, light textured (if sticky) serum & it is ridiculously active. I ALWAYS apply moisturiser on top & then I go to sleep & when I wake up in the morning my skin is perfect. Like mind blowing-ly beautiful. This is supposed to be used on the nights you don't use Liquid Gold but my skin can't cope with that, I tend to use the Liquid Gold, then give my skin a rest for 1-2 nights, use this, give my skin a rest for 1-2 nights & then use the Liquid Gold again....and so on & so forth until I run out of something. 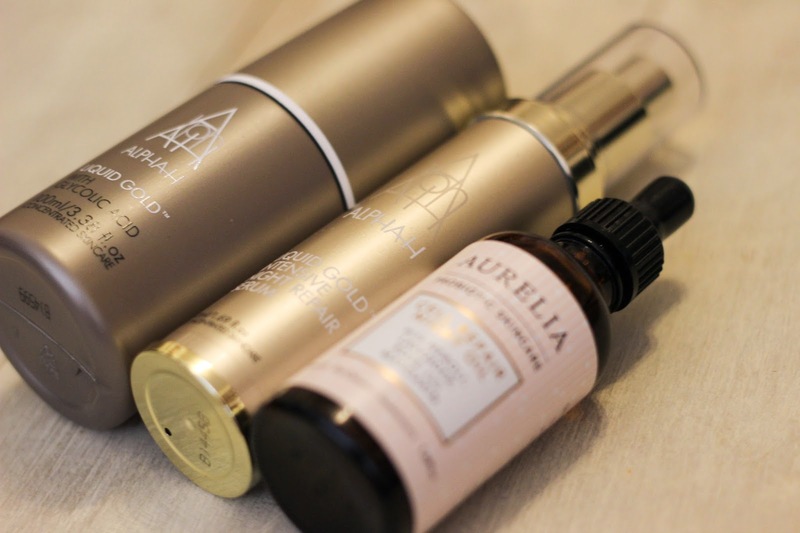 The product I use on the nights I "give my skin a rest" - my Aurelia Cell Repair Night Oil - is something I have actually reviewed before (review here) almost 4 months ago so I won't go into too much detail...it is an oil, you use 2-3 drops a night & it makes a HUGE difference to the condition of my skin. Exhaustion doesn't dry my skin out as much much, my skin is a lot less combination & the other problems I get are kept under control. I couldn't expect more of any product, if only doctors were as effective as this stuff! What I will go into detail on is the amazing value for money this product is!!!! I got this about 5 months ago & I have used it a minimum of 3 times a week since then (more like 4-5 times a week) but am barely past the label. That makes this a really cheap product! Okay, it may cost £45 (not a small amount of money) but by my estimate this 50ml bottle will last me at least 2 years. I worked it out & at 3 uses a week for two years? This product would cost me 14p per use. I have underwear that will have cost me more per use! If I am being honest, you could probably swap out both the Alpha-H products for a bottle of the PIXI glow tonic - (£16) but I am putting my foot down on the night oil, there is no way that anything else is as good as that stuff! What are the products making your skin look amazing? If you've tried anything I mentioned, what did you think of them?